Late last year, on the eve of launch, I announced the end of the CrunchPad project, sadly ending a very exciting one and a half year effort to create a very inexpensive touch screen tablet computer. Our partner, Fusion Garage, had inexplicably decided to simply terminate the partnership over “nothing more than greed, jealousy and miscommunication.” A couple of weeks later they launched the device that we had worked on together under a new name, and we filed a lawsuit for Fraud and Deceit, Misappropriation of Business Ideas, Breach of Fiduciary Duty, Unfair Competitition and Violations of the Lanham Act. Except at the time we really didn’t know how ugly. After nearly a year of discovery it became clear that Fusion Garage, conspiring (there’s just no other word for it) with their PR firm McGrath Power, had been working for months to dramatically break the partnership, disregard our ownership of the project, and go to market without us. Jonathan Bloom at McGrath was the principle ringleader, and he and Fusion Garage actually planned the entire blowup from beginning to end. The only thing they didn’t expect was an actual lawsuit. 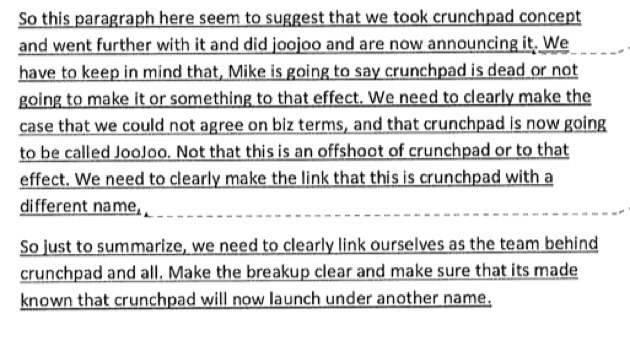 The blowup included a plan to reach out to press that competes with TechCrunch with a confusing story that suggested that we were mostly to blame. There was no evidence of any of that, but a lot of press ran with the easy to write story anyway. Sound crazy? It is. Truly insane. But it all happened, and the internal emails prove it. We’ve been through a lot of the regular pre-trial stuff at this point and we’ve amended our complaint to point out the worst of the new evidence that we’ve found. I’m embedding all the relevant documents below. A lot of time has been spent by Fusion Garage’s lawyers to try to keep these documents under seal, but they have recently been made publicly available. The first document below reads like a novel, and frankly it probably would make a great movie. I’d consider it highly entertaining, I guess, if I wasn’t the central figure being manipulated. Our attorneys actually made a table on page 19-20 to show how they were promising us one thing while conspiring with their PR firm to do exactly the opposite. 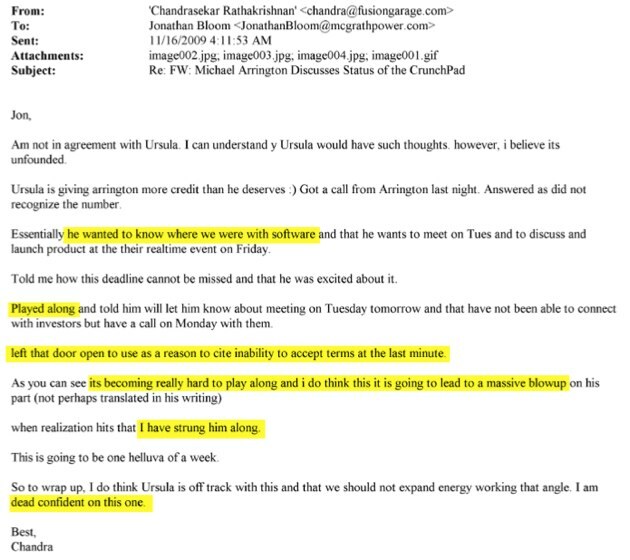 For example, the email supposedly from Fusion Garage’s investor was actually written by Fusion Garage and the PR firm. There was a lot of back and forth about the tone and language to make this fraudulent document seem real. Another example – Fusion Garage employee Stuart Tan, who still lists the Crunchpad as the project he’s working on on his Facebook profile, emails his girlfriend to tell her that he’s “really sucker these people.” He also mentions that he’ll be working on the project from our offices, and we’ve added pictures to the complaint showing the Fusion Garage team working with our team, from our offices, on the CrunchPad.